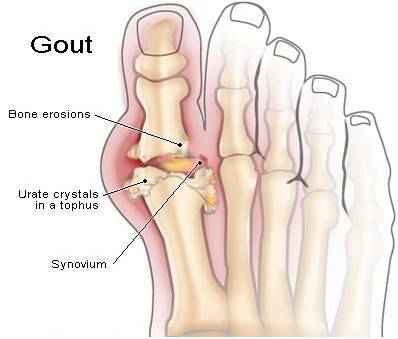 Gout is a condition that results from an overload of crystals of uric acid depositing in tissues of the body and features recurring attacks of joint inflammation (arthritis). Chronic gout can lead to deposits of hard lumps of uric acid in and around the joints, decreased kidney function, and kidney stones. Gout has the unique distinction of being one of the most frequently recorded medical illnesses throughout history. It is often related to an inherited abnormality in the body's ability to process uric acid. Uric acid is a breakdown product of purines that are part of many foods we eat. An abnormality in handling uric acid can cause attacks of painful arthritis (gout attack), kidney stones, and blockage of the kidney-filtering tubules with uric-acid crystals, leading to kidney failure. On the other hand, some patients may only develop elevated blood uric-acid levels (hyperuricemia) without having arthritis or kidney problems. The term "gout" commonly is used to refer to the painful arthritis attacks. Gouty arthritis is usually an extremely painful attack with a rapid onset of joint inflammation. The joint inflammation is precipitated by deposits of uric-acid crystals in the joint fluid (synovial fluid) and joint lining (synovial lining). Intense joint inflammation occurs as white blood cells engulf the uric-acid crystals and release chemicals of inflammation, causing pain, heat, and redness of the joint tissues. Approximately 1 million people in the United States suffer from attacks of gout. (Did you know that none other than Benjamin Franklin had terrible gouty arthritis!) Gout is nine times more common in men than in women. It predominantly attacks males after puberty, with a peak age of 75. In women, gout attacks usually occur after menopause. Among the male population in the United States, approximately 10% have hyperuricemia. However, only a small portion of those with hyperuricemia will actually develop gout. In addition to an inherited abnormality in handling uric acid, other risk factors for developing gout include obesity, excessive weight gain, especially in youth, moderate to heavy alcohol intake, high blood pressure, and abnormal kidney function. Certain diseases lead to excessive production of uric acid in the body. Examples of these diseases include leukemias, lymphomas, and hemoglobin disorders. Interestingly, a recent study demonstrated an increased prevalence of abnormally low thyroid hormone levels (hypothyroidism) in patients with gout. The small joint at the base of the big toe is the most common site of an acute gout attack of arthritis. Other joints that can be affected include the ankles, knees, wrists, fingers, and elbows. Acute gout attacks are characterized by a rapid onset of pain in the affected joint followed by warmth, swelling, reddish discoloration, and marked tenderness. Tenderness can be intense so that even a blanket touching the skin over the affected joint can be unbearable. Patients can develop fever with the acute gout attacks. In rare instances, an attack can last for weeks. Uric-acid crystals can deposit in tiny fluid-filled sacs (bursae) around the joints. These urate crystals can incite inflammation in the bursae leading to pain and swelling around the joints, a condition called bursitis. In chronic (tophaceous) gout, nodular masses of uric acid crystals (tophi) deposit in different soft tissue areas of the body. 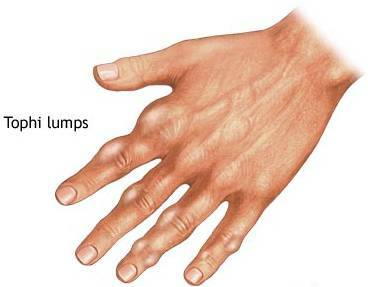 Even though they are most commonly found as hard nodules around the fingers, at the tips of the elbows, and around the big toe, tophi nodules can appear anywhere in the body. They have been reported in unexpected areas such as in the ears, vocal cords, or (rarely) around the spinal cord! Gout is suspected when a patient reports a history of repeated attacks of painful arthritis at the base of the toes. Ankles and knees are the next most commonly involved joints in gout. Gout usually attacks one joint at a time, while other arthritis conditions, such as systemic lupus and rheumatoid arthritis, usually attack multiple joints simultaneously. The most reliable test for gout is finding uric-acid crystals in the joint fluid obtained by joint aspiration (arthrocentesis). Arthrocentesis is a common office procedure performed under local anesthesia. Using sterile technique, fluid is withdrawn (aspirated) from the inflamed joint, using a syringe and needle. The joint fluid is then analyzed for uric-acid crystals and for infection. Shiny, needle-like uric-acid crystals are best viewed with a polarizing microscope. The diagnosis of gout can also be made by finding these urate crystals from material aspirated from tophi nodules and bursitis fluid. Some patients with a classic history and symptoms of gout can be successfully treated and presumed to have gout without undergoing arthrocentesis. However, establishing a firm diagnosis is still preferable since other conditions can mimic gout. These include another crystal-induced arthritis called pseudogout, psoriatic arthritis, rheumatoid arthritis, and even infection. X-rays can sometimes be helpful, and may show tophi-crystal deposits and bone damage as a result of repeated inflammations. X-rays can also be helpful for monitoring the effects of chronic gout on the joints. Preventing acute gout attacks is equally as important as treating the acute arthritis. Prevention of acute gout involves maintaining adequate fluid intake, weight reduction, dietary changes, reduction in alcohol consumption, and medications to lower the uric-acid level in the blood (reduce hyperuricemia). Maintaining adequate fluid intake helps prevent acute gout attacks. Adequate fluid intake also decreases the risk of kidney-stone formation in patients with gout. 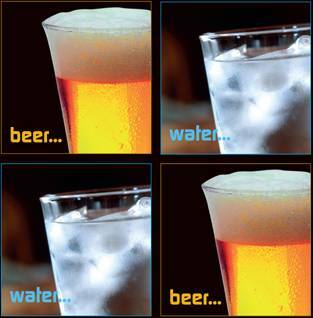 Alcohol is known to have diuretic effects which can contribute to dehydration and precipitate acute gout attacks. Alcohol can also affect uric-acid metabolism and cause hyperuricemia. It causes gout by impeding (slowing down) the excretion of uric acid from the kidneys as well as by causing dehydration, which precipitates the crystals in the joints. Dietary changes can help reduce uric-acid levels in the blood. Since purine chemicals are converted by the body into uric acid, purine-rich foods are avoided. Examples of foods rich in purines include shellfish and organ meats, such as liver, brains, kidneys, and sweetbreads. Researchers have reported, in general, that meat or seafood consumption increases the risk of gout attacks, while dairy food consumption seemed to reduce the risk! Protein intake or purine-rich vegetable consumption was not associated with an increased risk of gout. Total alcohol intake was strongly associated with an increased risk of gout (beer and liquor were particularly strong factors). There are three aspects to the medication treatment of gout. First, pain relievers such as acetaminophen (Tylenol) or other more potent analgesics are used to manage pain. Secondly, antiinflammatory agents such as nonsteroidal antiinflammatory drugs (NSAIDS), colchicine, and corticosteroids are used to decrease joint inflammation. Finally, medications are considered for managing the underlying metabolic derangement that causes hyperuricemia and gout. This means treating the elevated levels of uric acid in the blood with medications that reduce these levels. 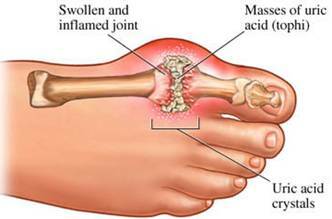 NSAIDS such as indomethacin (Indocin) and naproxen (Naprosyn) are effective antiinflammatory medications for acute gout. 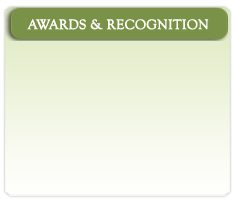 These medications are tapered after the arthritis resolves. Common side effects of NSAIDS include irritation of the gastrointestinal system, ulceration of the stomach and intestines, and even intestinal bleeding. Patients who have a history of allergy to aspirin or nasal polyps should avoid NSAIDS because of the risk of an intense allergic (anaphylactic) reaction. Colchicine for acute gout is most commonly administered by mouth but can also be given intravenously. Orally, it is given hourly or every two hours until there is significant improvement in pain or the patient develops gastrointestinal side effects such as severe diarrhea. Other common side effects of colchicine include nausea and vomiting. Corticosteroids, such as prednisone, given in short courses, are powerful anti-inflammatory agents for treating acute gout. They can be administered orally or injected directly into the inflamed joint. Corticosteroids can be prescribed to patients who have accompanying kidney, liver, or gastrointestinal problems. Long-term chronic use of corticosteroids is discouraged because of serious long-term side effects. Probenecid (Benemid) and sulfinpyrazone (Anturane) are medications that are commonly used to decrease uric-acid blood levels by increasing the excretion of uric acid into the urine. Since these drugs can, in rare instances cause kidney stones, they should be avoided by those patients with a history of kidney stones. These medications should be taken with plenty of fluid so as to promote the rapid passage of uric acid out of the urinary system in order to prevent stone formation. Allopurinol (Zyloprim) lowers the blood uric-acid level by preventing uric-acid production. It actually blocks the metabolic conversion from purines in foods to uric acid. This medication is used with caution in patients with poor kidney function, as they are at a particular risk of developing side effects, including rash and liver damage. Again, uric-acid-lowering medications, such as allopurinol, are generally avoided in patients who are having acute attacks of gout (unless they are already taking them). For unknown reasons, these medications, when started during an acute attack, actually can worsen the acute inflammation. Home remedies which can alleviate the symptoms of acute gout include resting and elevating the inflamed joint. Ice-pack applications can be helpful to reduce pain and decrease inflammation. Patients should avoid aspirin-containing medications, when possible, because aspirin prevents kidney excretion of uric acid. 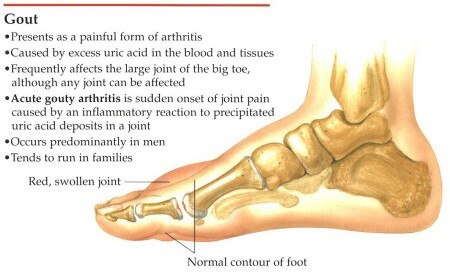 Painful gouty arthritis is caused by uric-acid crystal deposits in joint tissue. The tendency to develop gout and elevated blood uric-acid level (hyperuricemia) is often inherited. Gout and hyperuricemia can be promoted by obesity, weight gain, alcohol intake, high blood pressure, abnormal kidney function, and drugs. Gouty arthritis attacks can be precipitated by dehydration, injury, fever, heavy eating, heavy drinking of alcohol, and recent surgery. The most reliable diagnostic test for gout is the identification of crystals in joints, body fluids, and tissues. The treatment of an attack of gouty arthritis is different than the treatment of hyperuricemia.